The website didn't say how much brains--or even how many--I should eat, only that I should eat them in 48 hours OR ELSE. Why doesn't anyone pay attention to details anymore? Would it be so hard to add a simple line like, BTW, Maddy, 3 pounds of brains per week is plenty? Seriously, am I the first new zombie ever to ask? The following pathfinder is intended to be one part research guide, one part reader's advisory, and all parts zombie. Whether you are looking for information on zombies in film, literature, or other areas of pop culture, real-world zombies in the Caribbean, or a good book, movie, or graphic novel to escape to, the resources in this pathfinder have been put together to get you started. This pathfinder is designed to be used in conjunction with the resources available at the Rapid City Public Library in Rapid City South Dakota, but much of the information can be applied to any library system. The material collected here should be considered a starting point. While there are a number of zombie-related materials that are specifically written for a juvenile audience, this pathfinder is aimed at the adult and young adult audiences. That being said, if you come across a title that is unavailable at the Rapid City Public Library, don't hesitate to fill out a Suggest a Purchase form to ask the library to purchase the title or borrow it through inter-library loan. On each of the sections of this pathfinder, you will find links to various web resources, such as WorldCat, LibraryThing, GoodReads, the Internet Movie Database, and Rotten Tomatoes. These resources should help you find more information about these specific titles, including reviews, and serve as a diving board into the horde of zombie materials. Resources like WorldCat will even show you what libraries near you carry the title. 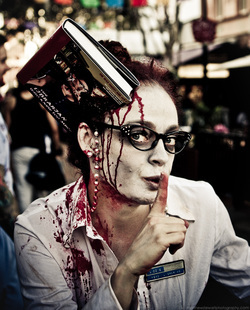 Image "Shh, don't disturb the undead walking the streets" by Matthew Stewart used under Creative Commons License CC BY-NC 2.0 and found via Flickr.